Okay, okay, I know that “Jamaican Me Crazy” has been used about a zillion times (or about 245,000 according to Google! ), but since I’m babbling about Jamaican food, I just had to say it. Feel free to groan audibly and throw things at me. It’s no secret that I love any and all things jerk spiced. 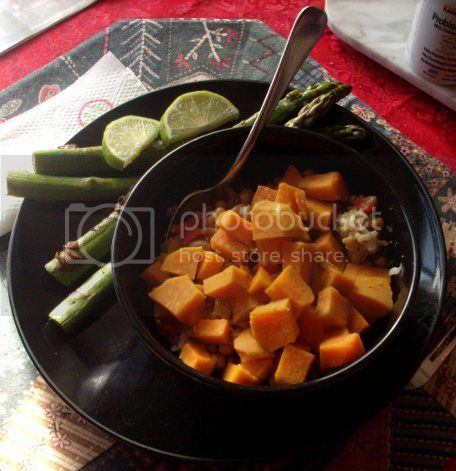 Chili, roasted veggies, sweet potato fries…if it’s vegan and you can cover it in jerk spice blend, I’ll eat it. I’d probably even eat jerk spice toast if given the chance, because I’m disgusting like that. But in this case, the focus on Jamaican fare started with an unusual asparagus recipe. I’ve warmed up to asparagus in recent years and both my Mom and Dad love it, so it’s one of those things that I’ll grab whenever it’s on sale regardless of whether or not I know what I’m going to do with it. This time, Appetite For Reduction gave me the answer. Dude, you guys. Jerk Asparagus. For real. I never would have thought of using that particular spice combination on asparagus, of all things, but it worked out surprisingly well. Though I suppose I shouldn’t have been surprised. Cinnamon and allspice have a way of making things awesome. Of course, much as I like jerk spice, we couldn’t just have jerk asparagus for dinner. The book suggested serving it as a side to Caribbean Curried Black-Eyed Peas with Plantains, so that’s what I went with. Except, being allergic to bananas, I’ve always been a bit wary of eating plantains. No matter! According to a tip with the recipe, steamed sweet potatoes could be used instead. And who am I to say no to sweet potatoes? This is the first curry I’ve ever seen that calls for habanero peppers. Lacking those, and knowing that they’d send my mom through the ceiling if I did have them, I used a serrano chile instead. And holy foop was this stuff still spicy! Even with coconut milk and rice to offset the heat, it was quite the experience. The spice mix also involved fresh thyme and a star anise, apparently to make it more Jamaican. Guess which one I was the most excited about? I can’t describe just how awesome a container of star anise smells when you open it up. I hope no one at the co-op was watching when I was buying ingredients, because I probably looked way too happy about that smell. Both the asparagus and the curry called for fresh lime: juice in the curry and slices to garnish the asparagus. I hardly ever have limes on hand, but for some reason there was one in the fridge this time! Whatever possessed me to buy it, I’m glad I did. It made a nice accompaniment to both dishes and, as you can see, looked nice too! This is definitely a recipe combination worth getting special ingredients for. I’d make it again just to give myself an excuse to buy more star anise! Have you ever had an entire meal inspired by on ingredient? How did it turn out? Yes, I *have* had a meal inspired by one ingredient, and it worked out very, very well! In a recent order from Penzey’s Spices they threw in a small jar of Turkish seasonings. None of the spices was particularly exotic on its own (with the arguable exception of sumac), but I’d never tried them in combination before. I built a meal around them, with a lovely yogurt-dill-cucumber salad called cacik, an interesting molasses- and sesame-rolled bread called simit, and formerly-frozen tofu cubed, coated with the seasoning and roasted, garnished with fresh mint. Admittedly, the simit was the big hit, but there were no leftovers that night!